Hey, I've had another slow fic-reading week, so this one is uber-uber-uber short and to the point. (I know, that's DC - I'm trying to be more open to non-Marvel fanfiction. I read less FrostIron that way. Not that there's anything wrong with FrostIron. Anyway, like I said, this one is short and sweet, and is told from the POV of Cisco Ramon. I love Cisco. He rocks. 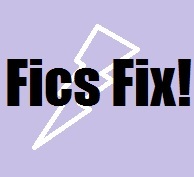 I'll try to fit a bit more fic-reading in in preparation for next week's Fics Fix.